This expedition is not currently scheduled. However we have run it in previous years and can do so again on request. Based in and around Mexico City this expedition will climb the four highest summits in the country. After a couple of days of acclimatisation in and around Mexico City at 2250m we will make a three day trip to the rocky Nevado de Toluca 4691m. Returning briefly to Mexico City we'll travel to our first two big snow-capped peaks which rise high above the capital to the southeast. Popocatepetl 5410m and Ixtaccihuatl 5230m are both volcanic peaks. Popocatepetl, an active volcano, is a relatively easy walk over snow but the ascent of Ixtaccihuatl is a more challenging scramble. After climbing these peaks we'll travel east to the small city of Orizaba to climb our third and highest peak - Pico de Orizaba 5636m also known by the Aztec name of Citlatepetl. This mountain is steeper than our first two summits but is still a suitable ascent for those with little or no previous experience on snow and ice. Mexico City is one of the worlds biggest cities. We'll spend a day in this huge and fascinating city both at the start and at the end of the expedition. The city is at a height of 2250m and this makes a good base for the purposes of acclimatisation. Mexico City was founded by the Spanish conquistadors on the site of the Aztec's capital of Tenochtitlan and was the capital of their empire in the New World. Today it is a sprawling modern city but in the compact central area there is an attractive mixture of Spanish colonial architecture and modern glass fronted skyscrapers. By far the most worthwhile sight to visit are the impressive ruins of the ancient city of Teotihuacan, including the pyramids of the Sun and Moon. 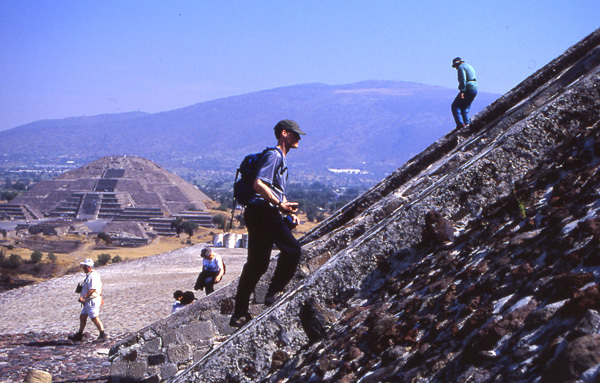 The Pyramid of the Sun is one of the world's largest pyramids. Teotihuacan is about 50km northeast of Mexico City and dates from about 150AD. It was a very large city at that time with perhaps 200,000 inhabitants. The Aztecs, whose empire only developed over 1000 years later, treated the site of Teotihuacan as a shrine. Today the ruins cover a huge area. At over 20 square kilometres it is easy to spend the best part of a day here. Popocatepetl, 5410m is an active volcano with a spectacular crater at the summit. The volcano has been intermittently active in recent years, most recently in 2012 and ascents are often not permitted by the authorities. Popocatepetl is only 50km from Mexico City and on clear days there is a beautiful view of it and its twin peak Ixtaccihuatl from the outskirts of Mexico City. If the mountain is open we'll climb Popocatepetl by the normal route on the north side of the mountain from Tlamacas above the Paso de Cortes. 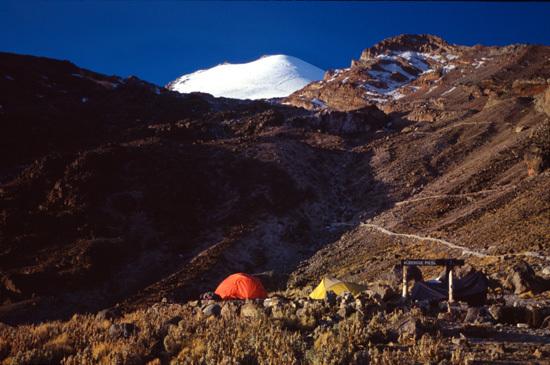 The ascent takes one long day from the Tlamacas huts to the crater rim. The ascent is generally an easy walk over scree and snow slopes. Ixtaccihuatl, at about 5230m high, is an extinct volcano lying just 25km north of Popocatepetl. After climbing Popocatepetl we'll climb Ixtaccihuatl by the Ayoloco glacier route. This starts at La Joya to the south of the mountain and will also take us one long day, though there is an option to stay at a hut as well. 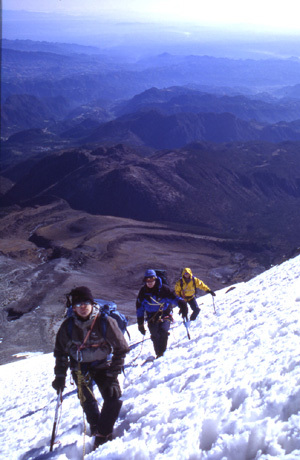 As with all three of the big summits in Mexico the route on Ixtaccihuatl is a mixture of climbing on scree, snow and rock. It is a little more tricky than the ascent of Popocatepetl. We've allowed an extra day in our schedule for Popocatepetl and Ixtaccihuatl in case bad weather or poor acclimatisation slows us up. 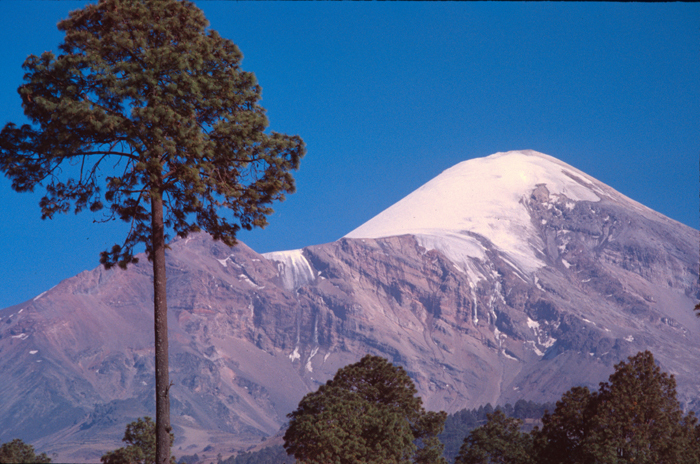 The remote Pico de Orizaba (pictured above) is the highest peak in Mexico and reaches about 5636m. It is a glaciated volcano lying about 200km west of Mexico City. We will climb by the normal route on the Jamapa glacier on the north slopes of the mountain from the huts at Piedra Grande (4260m). From here the summit is one long day of climbing over rock and scree then the snow slopes of the Jamapa glacier. Orizaba is a bit steeper than the other volcanoes but still an easy enough ascent technically, but hard work physically. 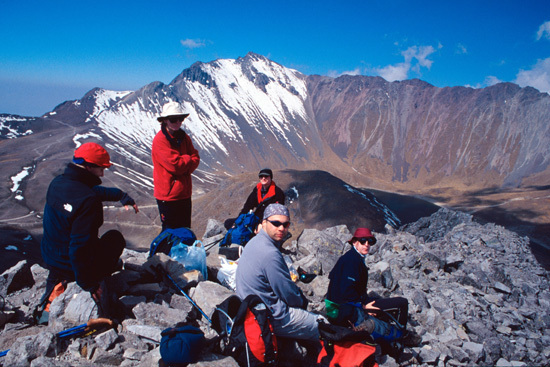 As a warm up before tackling the three highest peaks we'll climb Nevado de Toluca, 4691m. This peak lies east of Mexico City and is easily climbed in one day as there is a road to the two crater lakes at about 4200m. The peak is a blown out volcanic crater with only the rocky rim remaining. The ascent from the road at these lakes to the highest point of the crater rim, known as Pico del Fraile, is a rock scramble in normal conditions. We climb in Mexico at the start of the dry season and can expect mostly pleasant sunny weather. However we may be unlucky and experience a short period of stormy weather. The Mexican volcanoes are very big mountains and it may be quite cold and windy on summit days. At night and at altitude temperatures are normally low, going down to just below freezing high on the mountains, so bring a warm sleeping bag for the huts and camps! Clients should be experienced hillwalkers or trekkers. Some experience of winter walking and use of an ice axe would be an advantage but is not essential. Ascents to over 5000m require a good level of fitness. Good hillwalking and mountaineering fitness is obviously important, but for high altitude expeditions clients should have good cardiopulmonary fitness too. This can only be maintained, or obtained, by a program of exercise such as sprinting (not jogging), squash or sprint cycling. This should be done in small doses over a period of at least two months (e.g. half an hour every other day). Our expeditions are designed to be small and flexible. The expedition will be co-ordinated, organised and lead by us, but we will consult expedition members when planning the details of the trip. We publish an outline itinerary so that we have a framework on which to build the expedition. Please note however that the leaders decision is final where the safety of the group or any member is in jeopardy; for example where retreat or diversion is necessary due to illness or bad weather. The maximum size of this expedition will be four persons plus leader. We need a minimum of three bookings to run this expedition. All clients must be insured for medical costs and repatriation in an emergency We recommend having insurance for baggage, personal liability and cancellation as well. If you would like advice on insurance please ask. Although Mexico is one of the more prosperous countries in Latin America it is very likely you will get an upset stomach or gut at some stage. To minimise the risk it is a good idea to avoid tap water, unwashed fruit, ice and all seafood. Vaccinations for tetanus, typhoid, polio and hepatitis are needed! Malaria and yellow fever precautions are not necessary as we won't be visiting mosquito infested areas. Mexico is a relatively safe country to visit but it is important to stay alert when in busy public areas and to guard your belongings carefully. Whilst deceit and short-changing are common, muggings and other violent crime are rare in the areas of the country we travel to. We will issue further advice to all clients before departure. This is an adventurous trip and all clients will be exposed to an element of risk by taking part in this itinerary. While we take all reasonable precautions to reduce risk it is neither possible nor desirable to completely eliminate these additional risks. Some of these hazards carry the risk of serious injury or death. It is important that you understand the risks involved before signing our booking form. We have identified the following areas as the principal additional risks of this itinerary. This is not a fully inclusive list - please ask if you would like to see a more detailed risk assessment of this itinerary before booking. Driving, hotels and general safety : In Mexico driving, fire safety standards and general safety standards are not as high as in Europe. Crime : Mexico has a higher crime rate than Europe. As a wealthy tourist you may attract attention. Remoteness : You will be many hours from medical help for short periods of time. Mountain Hazards : In certain places you may be subjected to a slight risk of rock slips. In stormy weather there might be a slight risk of avalanche. There is also a slight risk from volcanic activity on the ascents. Our price does NOT INCLUDE - your flights, your insurance, your hotel/hostel accommodation, your meals taken at cafes and restaurants, your share of communal travel costs (e.g 4x4 rental, mule costs), your personal climbing and camping equipment (i.e. used by you alone, such as sleeping bag, ice-axe, crampons), permits or peak fees payable by yourself.